Need Info - Silent World Key Largo, FL. I have a weight issue that maybe some of the more advanced divers can help me with. Regardless of water temperture I prefer diving w/ either Steel 95’s, 119’s or 130 cylinders, primarily because of the negative buoyancy characteristics. I find myself in a situation where I am forced to dive with AL 80 because most liveaboards don’t offer steel cylinders on the vessel. I also contacted practically every dive op on Grand Cayman and not one offers steel cylinders. Here’s the situation my first open water dive I experienced an unintentional ascent w/an aluminum cylinder and haven’t been comfortable using them since. PADI has an Adventures in Diving Peak Performance Buoyancy chapter that outlines basic standards. Cold Water - 7mm wetsuit - 10% body weight plus 10lbs + 5 for the Al tanks. Now you have an idea why I don’t care for cold water diving and Al 80’s. My first dives at Breakwater I couldn’t submerge so they added 5 more lbs to my BC. It was a nightmare and I literally hated the experience. With steel tanks in warm water I only need 4 - 6 lbs depending upon which of the steel tanks I use. Would you start with the 12 - 14lbs and just adjust from there, or, does anyone have something a bit more accurate? BTW - The 250 - 255 I carry around is a bit dense. Try figuring out how much you need for your current setup, wetsuit, & bc to stay neutral or just 1feet below the surface or be able to freedive. Once you know this then you just add +3-4lbs to help sink the AL80 when it’s near empty. It may take you one dive to figure this out so put loose weights near the boat entry and tell the deck crew you will be asking for more weight if you need to. Add in increments of 2,4, &5 til you work it all out. Then record it in your log so you can remember it. Yyou can take some weight off the belt by going to a steel backplate and weighted STA. In doing this with an AL3 and my 3mm suit I need no weight. With my dry suit and all my undergarments ~40f water it really pays off as I can put the needed weight into the pockets and not need a belt. Keeps things streamlined. While YMMV it surely pays to try different configurations to find one that is comfortable and works for you. That’s an excellent suggestion. I never considered that as an option but it’s a very good one. The only problem I can see w/that is I’ve just bought a brand new set of gear already. I agree with the both recommendations. According to the PADI "play book" you should, while holding a "normal" breath, at eye level float. If you exhale you should begin to sink, and if you inhale you should float. Start by adding weight to your weight system until you float at eye level. Once you have achieved this, add about 4 pounds because as stated the AL 80 will be "about" 4 pounds positive at the end of your dive. If it were me, I would add maybe about 6 lbs so you know for sure you can get down. The problem is being positively Buoyant. Being a little too heavy is better than being not heavy enough. As you learned it is hard to stay down with that AL 80 at the end of the dive. You don’t want an uncontrolled ascent at the end of your dive, that would be bad! Most of the time it’s just hard to do your safety stop when you have to fight buoyancy! As you get more comfortable, try to take away some weight to fine tune your buoyancy. Try going to a pool (in full wetsuit and gear)to practice this before your big trip. This will let you get adjusted to your weight changes. Just remember, a pool is fresh water and you need more weight in salt water...Good luck! I dive cold and warm water. I dive wet and dry. I also dive salt and fresh water, so I use a lot of diffrent setups. I have found that the PADI weight suggestions are highly overstated. 40 lbs is a lot of weight. The way to check weight stated by the last entry is good, but doesn’t account for extra equiptment, bcd, conditions and diver breathing. What I have done, just like the last suggestion said, plus: be confortable with the setup. If you don’t relax it will be harder to go down. It may sound trivial, but let drop about 10 lbs, make sure you let all air out of your lungs and be sure you are letting all the air out of your bcd. When I bought my new BC I loved it once under water, but for some reason is hard to get all the air out at the suface, so I learned to tilt myself to let air out better. For example Ice Diving (fresh water) I was not confortable, new equiptment and stressed I needed about 32 lbs. Now with the same equiptment I dive with 14 lbs. As you can see I’ve had same issues, so I hope I’ve helped. I can definitely see the issue of tilting to the side upon initial descent. Only in cold water did I experience difficulties descending. Based upon conditions I could use one of three different wetsuits in warm/tropic waters alone. With a steel cylinder I’ve never had to adjust the weight unless I moved down from a 3mm to a 0.5mm. Basically I think I’m going to have to go the old fashion route and just check and recheck both before the dive and during the safety stop. UC - You are so right.... 40lbs is a lot of weight. Especially when you have to walk distance, climb stairs and traverse over rocks and boulders to get to the ocean. This almost makes me want to pay the extra money and just travel with a steel cylinder? Sounds like excellent advice to me!! 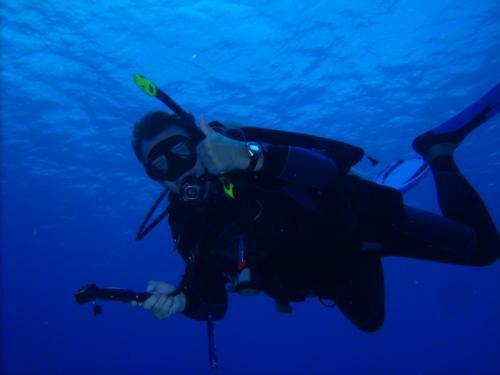 When Do You Need To Practice Better Buoyancy Control?